Oliver Letwin: "I have to apologise to constituents who wrote to me"
Minister Oliver Letwin has apologised for disposing of parliamentary papers, including constituents' letters, in a litter bin near Downing Street. The Daily Mirror reported that he had thrown out more than 100 papers in St James's Park. 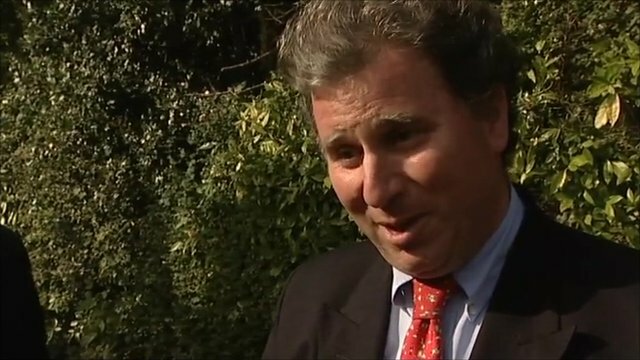 Mr Letwin told the BBC he had not thrown out government or classified papers, but apologised to constituents. Downing St said it was "clearly not a sensible way to dispose of documents". Labour has asked for an inquiry. West Dorset MP Mr Letwin, who is in charge of developing government policies within the Cabinet Office, was photographed by the Daily Mirror disposing of papers over five days in September and October. The Mirror claimed one document described how Parliament's intelligence and security committee (ISC) - which examines the work of MI5 and MI6 and GCHQ - "failed to get the truth" on Britain's involvement in extraordinary rendition. Allegations that agencies were complicit in CIA operations to secretly fly terrorist suspects abroad for interrogation are being examined by the Gibson inquiry. In one letter, Sir Malcolm Rifkind - the chairman of the ISC - is urged to revamp the ISC to "bolster public confidence in its work and in Parliament's ability to hold intelligence services to account". The letter's author, Andrew Tyrie - the Conservative chairman of the all-parliamentary committee on extraordinary rendition - notes that their correspondence is "personal and confidential". However, Sir Malcolm - a former foreign secretary - told the BBC the letter "did not amount to a row of beans in terms of secrecy" and was just correspondence between two backbenchers. The Mirror says the discarded documents were all dated between July 2010 and September 2011 and included correspondence which touched on subjects such as al-Qaeda's links in Pakistan, the government's flagship Big Society agenda and the future of the Forensic Science Service. But while Cabinet Office minister Mr Letwin acknowledged the story was "embarrassing" he said none of the papers were government documents and none were classified. "I was walking around dictating responses and simply wanted to make sure the pieces of paper were not weighing me down. I have to apologise to constituents who have written to me because, on reflection, I shouldn't have disposed of them in that way." Downing Street said the Cabinet Office would look into whether any of the documents concerned were sensitive. "Our understanding is that there were no classified documents," a No 10 spokeswoman said. "Most of the business which Mr Letwin does in the park is constituency-based." Asked what the prime minister's view was, the spokeswoman said: "Clearly, it's not a sensible way to dispose of documents." The Office of the Information Commissioner said it would be contacting Mr Letwin, The Mirror and Whitehall officials to find out what had happened and stressed it regarded breaches of data protection very seriously. The commissioner has the power to fine organisations and individuals up to £500,000 if it found anyone had suffered serious distress as a result of data protection breaches. Separately, Labour have written to Sir Gus O'Donnell, head of the civil service, to ask him to investigate how many documents the cabinet minister threw out in the park and whether any of them were classified. "I am sure you will agree that ministers have a duty to follow proper procedures and lead by example," Shadow Cabinet Office Minister Michael Dugher says in the letter. "This has clearly not happened in the case of Mr Letwin. As you aware, civil servants are subject to disciplinary procedures if the proper processes are not adhered to. It cannot be that there is one rule for ministers and another for everyone else." But the criticism was dismissed by Conservative MP Zac Goldsmith, who wrote on the Twitter website: "How is Oliver Letwin working in the park newsworthy? Whoever in Labour has asked for (yet another) inquiry should be put to sleep."